Thanks to the Petr Brandejs Band for the above New Year's greeting. 'We'll concentrate on children' is a good New Year resolution for all bands. Messages of goodwill also received during the holiday season include greetings from Christopher Howard-Williams and Didier Philippe of the La Roche Bluegrass Festival; Joel B. Espesset of Kehl, Germany; Lluís Gómez of Barcelona, Spain; Nugget and New West of Vienna, Austria; the Toy Hearts of Birmingham, England; Luca Bartolini of Genoa, Italy; and Monika and Eberhard Finke of Germany. In recognition of the support given by the International Bluegrass Music Museum (IBMM) to bluegrass outside the USA, here's a photo of Monika and Eberhard with Gabrielle Gray, IBMM director. British Bluegrass News #51 (winter 2009/10) has been posted out to members of the British Bluegrass Music Association (BBMA). The 44-page bumper winter edition (10% larger than the autumn issue) features the Belgian band Sons of Navarone on the cover; inside is a substantial interview with the Sons by Rick Townend, a full-page ad for the band, and a list of dates for their UK tour in mid February 2010. The issue also includes features on bluegrass in Northern Ireland, songwriter David Rozzell, the late Terry Holland, and the Crocker Brothers band. Tom Adams (USA) contributes an article and a banjo tab, 'BBN blues'. Multi-instrumentalist and BBN production editor Pat Francis reveals his ‘Favourites’, and 'The story behind the song' looks at John Henry Newton‘s ‘Amazing grace’. All this plus the regular 'What’s on', tour details and 2010 festival dates, CD and book reviews, 'Light in the window', 'SmallTalk', and ten area reports. This issue is the third to appear with Richard F. Thompson as editor-in-chief. British Bluegrass News is published by the BBMA, which was founded in 1990. To join the BBMA, contact the Membership Team, Clare and David Rozzell, by e-mail. I hope to see y'all at least when I'm on the road with my new project, Roots Experience [photo above], playing an exciting blend of traditional bluegrass music. As blatant as this self-advertisement may seem, I'd be pleased to answer all booking and related questions. The Associazione Musicale Melody of Italy announce that the second edition of their Concorso Musicale Europeo will take place in the city of Filadelfia, in the 'toe' of southern Italy, on 2-9 May 2010. This music competition is not specifically bluegrass - it is dedicated to the memory of the operatic composer Paolo Serrao (1830-1907), but extends over music in general. The Associazione Musicale Melody is linked to the EBMA's Facebook group, and some readers of the European Bluegrass Blog may benefit from checking out the AMM website. The first tour of the annual 'Bluegrass Jamboree! - Festival of Bluegrass and Americana Music' is over! December: 15 shows in 16 days: enthusiastic audiences applauded wildly and never let the musicians go before at least four encores were played. The theaters, concert halls, and art centers held between eighty and 450 people, mostly new to bluegrass. And they have been won over! Everybody was thrilled by the program that featured the archaic old-time and early golden era of country music sounds presented by Beverly Smith & Carl Jones. Quite a few eyebrows were raised when the bluegrass girls [of the Toy Hearts] from Birmingham, England, entered the stage for their unique mix of grassy originals and a new hybrid called Gypsy Grass! Headlining were the Steep Canyon Rangers, who impressed not only the bluegrass novices with their tight and powerful appearance, great vocals, hot instrumental breaks and catchy songwriting. The festival finale session [photo above] brought all eleven musicians back with some mandolin licks added by promoter and MC Rainer Zellner. The crowd had a great time and everybody joined in when the final song 'Will the circle be unbroken' rounded out the evenings. For all fluent in German there is a tour blog with some fotos, a flickr photo set will be up soon too, and there is already some footage on YouTube. Radio WDR3 will broadcast two hours of the show, including interviews, on 17 January, 20:05-22:00. I am sure you can listen online. The edition 2010 will be booked very soon and will tour in December again. We would definitely like to expand to other European countries. A tour blog in English for 4-11 December is on the Toy Hearts website. Merry Christmas to all friends of bluegrass music, waiting impatiently for the next GrevenGrass Festival to come! But it is still five months waiting time left, until we meet again at Pentecost. We are 'right in the middle' of our preparations for the 2010 GrevenGrass Festival and are talking to notable musicians, we like to engage. You will find more information on our GrevenGrass homepage after the turn of the year. We all wish you a peaceful Christmas and a happy new year, and we hope the time will speed up a little until Pentecost! If you are on the GrevenGrass e-mailing list, you will have received as a special Christmas treat a link to a version of 'Silent night/Stille Nacht' sung by Pam Gleba in the Irish language. Multi-instrumentalist, singer, songwriter, record producer, and engineer Randy Kohrs (USA) and the G2 Bluegrass Band (Sweden), #1 European Bluegrass Band 2007, will tour Europe together in May 2010, with Randy Kohrs as main lead vocalist and dobro player, and his regular fiddler Ashley Brown also part of the ensemble. In June, G2 will leave Europe to tour in the USA till October. Jim Lauderdale and Randy Kohrs won a Grammy award for the album Bluegrass diaries in 2008, and are nominated for the 2010 Grammy awards. Untapped routes, the second album by G2, will be released worldwide in 2010. The full press release on the tour can be seen here. Please note that the tour will be in May, and not in April as stated in the release. To book Randy Kohrs and G2, contact Tobias Strömberg by e-mail or 'phone +46 (0)7022 94505. La Roche Bluegrass Festival (French Alps, July 29 - August 1 2010) is now taking applications to play (in the contest or not). Applications should be sent by January 31, 2010. 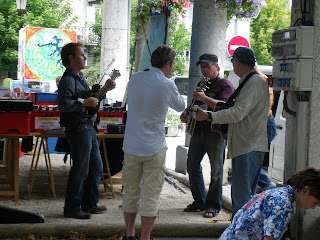 To download the application form go to www.larochebluegrass.fr and click on the page "Info for Bands". Information can be found there on the festival, the location and on conditions for playing. Bradley, Gulley and Fox is so far booked as a headline act. This is Dale Ann Bradley (3 times female vocalist of the year), Steve Gulley of Mountain Heart and Kim Fox of 3 Fox Drive. They are scheduled to be accompanied by Alan Bibey (Mdn) and Joel Fox (Bjo). Kreni, contest winners in 2009, is also booked. We are currently in discussions with two more US bands and 2 more European bands. Me and my family wish you all a Merry Christmas and that at least a few of your dreams for 2010 will come true. Anyone who normally sends news to Richard Hawkins for posting on the European Bluegrass Blog should please send it instead to the blog's own e-mail address between 21 and 27 December, when he will be unavailable for posting news. We recommend that the blog address should be used at all times. When Richard is available, he can deal with news received there; and when he is not, it can be handled by another member of the EBB team. Updates 31 Jan./3 Feb 2010: If you use this link, everything you want to transmit should be in the main text of the e-mail, including full URLs and e-mail addresses. Although the blog's address will receive e-mails, it will not receive any attachments. The EBMA's European Bluegrass Directory is at present in its seventh edition (2008/2009), with over 770 entries. There have been many developments in European bluegrass since it was compiled two years ago, and the EBMA board of directors has decided that an eighth edition (2010/2011) shall be produced in print, using the same format as for previous editions. Thierry Schoysman of Bluegrass in Belgium is in charge of compiling the new edition. While the EBMA national representatives will have an important role in gathering and forwarding information, the board welcomes contributions from bands, event organisers, luthiers, media people, and everyone else who is active in bluegrass in Europe. All material should be delivered to Thierry Schoysman not later than February 2010. The format for a European Bluegrass Directory after 2011 will be considered in the context of other European bluegrass publications. Sore Fingers Week (5-9 April 2010): Tutor lineup almost finalised! We are now getting close to a final lineup of musicians to provide another brilliant Sore Fingers Week next Easter! First with the bad news, though. Mat Flinner, who we were really looking forward to having back for a second time, has had to pull out as he and his wife are expecting a new baby which is due right in the middle of Sore Fingers Week. Naturally, Matt wanted to be around for the new arrival and will now not be teaching next year. But we will follow up him up for 2011. Sorry if anyone is disappointed, but we do have a brilliant alternative tutor, John Reischman, and are negotiating with another great chap, Sam Bush. I’m expecting news from Sam shortly so sit tight and keep logging on for news. As usual the 'recession-proof' banjo players have been booking en masse again, and though we are not yet close to beating last year’s record number of 118 banjo students, we are on the way. So Tony Furtado’s class is now over-subscribed. But we have the fantastic Alan Munde booked to teach a second class. Anyone already registered wishing to change from Tony’s class to Alan’s, should let us know without delay. Both Tony and Alan have been innovators in their time but are contrasting in styles, and that should make it an easy choice for students. It is usual to have to give a few classes the hard sell at this time of year, and an early commitment helps us make sure we will have enough students to justify the cost of the flights which we will be booking early next year. So if you are planning to book, it helps us to know sooner rather than later; so get your booking form out to us, please. All that remains is to wish you all a Merry Christmas and a Happy New Year for 2010 and we look forward to seeing you at Kingham at Easter! The International Music Festival Summit is inviting the most accomplished music festival executives and directors to share their expertise with a high-level audience of executives eager to launch or expand their own music festival initiatives. Speaker titles include: Executive Director, Festival Director, Managing Director, Artistic Director, Program Director, VP of Programming, President and CEO, Director of Marketing, and Project Manager. A Grey Fox colleague and I attended the 2009 IMFCON in Las Vegas last week. We were very happy with the topics and speakers and even happier with the contacts we developed. I would encourage colleagues (especially European festival people) to attend the next conference coming up in April in Amsterdam! Feel free to contact me if you have any questions. I'll be writing an article for the next IBMA newsletter. We really did learn new and exciting things. It was great to think outside the box with other event producers. Grey Fox was the only bluegrass festival per se at this conference. We made some great connections to the 'outside world' of music festivals. It was a small gathering (about 70 people including speakers) of jazz, jam, eclectic, world and other music festivals. So it was really easy to have access to the speakers and to other participants. Some of the other events included Bonnaroo, High Sierra, Summerfest, New Orleans Jazz Fest, Newport Jazz, etc. I would think that the Amsterdam conference would be a great mix as well. Contact Mary Burdette by e-mail. Please note the new DATE for the workshop - one day later than originally announced. The times and cost remain as shown in the update of 3 December. *Chords & arpeggios (advanced) — A simple approach to understanding and applying chord theory for the mandolin. *Finger busters — Right- and left-hand exercises to develop articulation, strength, and agility. *Mike’s Simple Gifts (beginner) — The art of creating a mandolin part to complement and enhance a song in duo playing. *Swingin’ the mandolin — Putting it all together with that elusive rhythmic propulsion. I've been really blessed this year, and my travels have taken me to some wonderful new places here in Europe and also to US. I performed to large crowds and intimate audiences; familiar faces and new friends. Highlights of the year are my tour with guitar wizard Mark Cosgrove, sharing the stage with guitar greats David Bromberg, Frank Vignola, Muriel Anderson, Jacques Stotzem, saying goodbye to Stefano's bibs ... wow what a year! Roberto's latest album, Unknown legends, is being well received; another favourable review has appeared on Minor 7th online magazine. This month's issue of the German magazine Akustik Gitarre includes an interview with Roberto, and his tune 'Surprised' is included on the companion CD. In a special Christmas sale, all Roberto Dalla Vecchia CDs can be bought on CD Baby at $9.95 during the month of December. The offer is good until 31 December while supplies last. As a free seasonal gift, a simple arrangement of the classic Christmas carol 'Silent night', arranged for solo acoustic guitar, can be downloaded as an mp3 and with tablature from here. Non-players who like listening to Christmas music should download the mp3 file labelled 'long version'. Most of Roberto's music is available at iTunes, or as downloadable mp3s at Amazon. In January active booking will begin for dates in Austria, Germany, and Switzerland for Roberto's June 2010 tour with Mark Cosgrove. Anyone in these countries who would like priority consideration for a concert in home, school, or venue, or who just has questions about the process, should contact Roberto by e-mail. Video footage from a house concert in the USA by the Cosgrove/dalla Vecchia combination can be seen on YouTube. I wish each and every one of you the best of holiday seasons, and here's to a wonderfully happiness-filled 2010. Thank you for being there, and for supporting music and the arts. A website improvement we're excited to announce is our addition of international language translations of all the permanent features on our site, such as our Hall of Fame Bios and historical sections. They will be presented in French, Spanish, Russian, German, Czech, Chinese, Portuguese, Italian, and Japanese. We are excited to be able to help make bluegrass history and culture even more accessible to more fans around the world. Since our announcement, we've lined up translators for all languages except Italian, but we're confident that we'll locate someone soon! 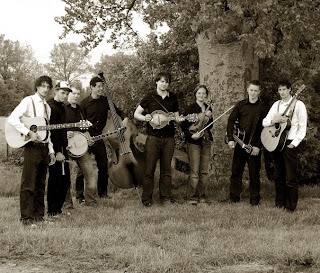 The Italian bluegrass scene should be well equipped to help out the IBMM in this latest of its welcome initiatives in support of bluegrass music worldwide. The IBMM's annual River Of Music Party (ROMP) festival in 2010 will include - in addition to Acousticure (Hungary), the G2 Bluegrass Band (Sweden), and the Mideando String Quintet (Italy) - a reunion of all living Blue Grass Boys who played with Bill Monroe, and the annual Pioneers of Bluegrass Reunion. Following the Celtic Connections festival in Glasgow, Scotland, early in the new year, artists from the Transatlantic Sessions part of the festival will make a short tour in England and Ireland. The package consists of Shetland fiddle maestro Aly Bain and dobro legend Jerry Douglas, Nickel Creek vocalist/fiddler Sara Watkins, O brother where art thou? soundtrack star Dan Tyminski (aka the voice of George Clooney), Eddi Reader, Tim O’Brien, Darrell Scott, Karen Matheson (Capercaillie), Bruce Molsky, and Cara Dillon. Bruce Molsky is scheduled to play in Norway later in February: at the Rauland Music Festival (17-21 Feb.), and TBA dates with Ånon Egeland (22-3 Feb.) and with Annbjørg Lien (25-8 Feb.). Peter Radványi (left), co-founder and formerly executive director of Dobrofest, announced on the festival website on 3 December that he is no longer a member of the Festival Committee Dobrofest-Trnava. Dobrofest, which was held annually at Trnava, Slovakia, from 1992 to 2008, is the only music festival in the world dedicated to the resophonic guitar and to the memory of its inventor John Dopyera (1893-1988). I am very proud to work for Dobrofest from the beginning until the last year and very grateful that I could learn all the amazing good dobro people from around the world. In the latest newsletter from the Mismountain Boys of Bergamo, Italy, you can read a review of their latest CD, Spaghetti Western Cafe, by Fabrizio Poggi from Folk Bulletin magazine; buy the mp3 of their single 'Jingle Bells (Suna Campanèll)' with a donation to the Red Cross; see photos from their Eurobrasserie live concert on 14 November; and check on their upcoming shows. The Mismountain Boys are Roberto 'The Hook' Braiato (mandolin, guitar, background vocals), Remo 'Mr Cadillac' Ceriotti (5-string banjo, dobro), Franco 'The Captain' Fanizzi (guitar, lead vocals), Fabio 'Cowboy Smile' Bestetti (upright bass, background vocals), Italo 'Babayou' Gualandris (accordion, vocals), Isabella 'Belle Starr' Saradini (vocals, guitar, and Tista 'West Point Records' Rota (drums and percussion). The band are also on Facebook, MySpace, and YouTube. Class size is very limited - check out the website for all the classes offered. This is a fantastic music gathering. The second son of Erik Igelström of Sweden and his wife Hanna was born on the afternoon of Thursday 26 November at home in Södersjukhuset, Stockholm. Not yet named when the first announcement was made, the new arrival is a robust (about 4.5 kg) new brother for two-and-a-half-year-old Milton. The proud father is the mandolin player for the G2 Bluegrass Band. Read more in today's post on the original Bluegrass Blog. World-class guitarist Beppe Gambetta will present his new CD, Rendez-vous, in a solo concert at the New Acoustic Gallery in Solingen, Germany, on Sunday 6 December, beginning at 8.00 p.m.
Beppe Gambetta, 'with Italian roots in his blood and American music in his heart', has created Rendez-vous as a series of duets with the guitarists he most admires. Tickets for the concert are €18 VV - €22 AK - €14 for students and pensioners. The hotline for booking is +49 0212/2474007. 25 November 2009 was a memorable evening for musicians and fans at the Bulgarian national radio in Sofia. It was a special concert, recorded live at the beautiful Studio 1 Hall, and packed with more than 250 people. Recordings will be archived in the 'golden Bulgarian radio fund' to be played on special occasions. Lilly of the West performed a mix of country, bluegrass, western swing, blues, and some original material. The band featured Lilly Drumeva (vocal), Yasen Vasilev (guitar), Ivan Penchev (fiddle), and Svoboda Bozduganova (upright bass), with guests Rayko Pepelanov (guitar), Michail Shihskov (dobro, piano) and Rumen Boyadjiev (drums). The concert finished on a high note with 'My window faces the south', on which everyone played a solo, followed by Leonard Cohen’s 'Hallelujah' as an encore. Guests were treated to a glass of wine and snacks after the show. The encore, 'Hallelujah', can be seen on YouTube. Thanks to Jan Michielsen, guitar player with 4 Wheel Drive (D/NL/B), fans of the band can find photos of 4WD on the Bluegrass Ireland Blog, showing them at this September's Omagh festival in Northern Ireland. On the left: Ulli Sieker in the background as Joost van Es and Jurgen Biller get intense on fiddle and banjo. Videos of seventeen live numbers by the band at a show in the Netherlands can also be seen on YouTube. Rosta Capek did a great job in arranging for our accommodation and meeting facilities, and with the help of Jiri Kralik (aka Fiddle George) we had a wonderful evening out jamming with some of our Czech musician friends. Ondra Plucha and Risa Podhrasky of Blackjack, Jiri Kralik, Jiri Bok, and Tom Drdaki joined board members Petr Brandejs, Martino Coppo, and Angelika Torrie in playing, while the others and some guests enjoyed listening into the late hours. Emmy & the Bluegrass Pals are a traditional-bluegrass-oriented four-piece band based in Drenthe, in the north-east Netherlands, comprising Emmy Benning (upright bass, vocals), Johan Lubben (guitar, vocals, mandolin), Jan Klungel (banjo, vocals), and Ron Duursma (guitar, vocals). You can see and hear more of the band on their MySpace site and on YouTube. For bookings and more info, 'phone Johan Lubben at +31 (0)638696273. Thanks to Floris de Vries, banjo-player in Tangarine & Friends (NL), for news of the band - 'seven young musicians with a big heart for folk and bluegrass music', who play their own folk songs with traditional bluegrass instruments, and share in their songs their vision on politics, religion, and life. 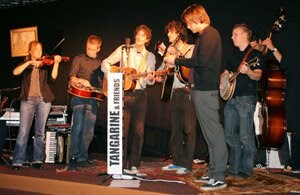 Tangarine & Friends started out with the brothers Arnout and Sander Brinks who started writing songs at an early age, influenced by Simon & Garfunkel, Bob Dylan, and the Beatles. After a few years of playing in a changing combination of band members, their first album, Between the lines, was released in January 2008. Their second album was released not long after that, in October 2008, with the name Fields of poetry. Later more people joined the band and Tangarine became Tangarine & Friends. Last month they released a new single, 'Fields of poetry', with a very fancy videoclip on YouTube. Last August the band recorded their third album, which is scheduled for release in January 2010. Partner with the Bluegrass Museum in the new Ambassadors Program! The International Bluegrass Music Museum wants to partner with you! We’re starting an official Bluegrass Museum Ambassadors Program, and we’re inviting your association to participate. Your association will appoint or elect a person who is willing and enthusiastic about being an Ambassador from your association to the International Bluegrass Music Museum. This Museum Ambassador will work with the Bluegrass Museum on special projects, report news and information for our newsletter, report Museum news back to your association for members and newsletters, encourage Museum membership and donations, encourage donation of bluegrass artifacts to the Museum, and attend a yearly meeting of Ambassadors at ROMP in Owensboro each year. ROMP takes place the 4th weekend of June. Ambassadors will receive a complimentary IBMM membership, a VIP ROMP pass (which includes VIP access to all events, backstage privileges, meals with Artists/Pioneers), and an Ambassadors t-shirt. The museum will arrange low-cost lodging for your stay at ROMP, getting you in on our artists’ rates (typically $54/night + tax). Designate your official Museum Ambassador and send us the following information. 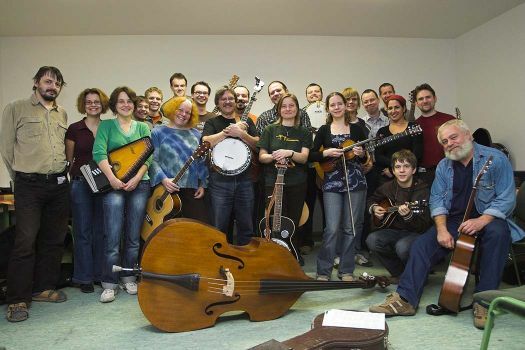 The 1st Bluegrass Workshop at Nyíregyháza, Hungary, was held last weekend. The international instructor team was made of four members of the Czech bluegrass band Křeni (Ondra Kozák, guitar, fiddle; Michal Wawrzyczek, banjo; Lukáš Rytíř, bass; Karel Začal, dobro) with Michal Barok from Slovakia added on the mandolin. Three days of staying at Nyíregyháza contained the instruction of all major bluegrass instruments, the build-up of a bluegrass band including the function of each member, build-up of harmony vocals, two concerts, and of course many many fun by jamming, talking, playing foosball, zombie party, etc. We would like to say thanks for all the instructors and especially Jónás Tibor, the organizer who made this workshop possible. We hope to meet again next year! The Tony Trischka School of Banjo makes it possible for pickers anywhere in the world to register ($60 for three months) for online lessons at beginning, intermediate, or advanced level from one of the greatest living banjoists. The student body now includes pickers from England, Germany, Spain, and Australia. The website already has over 160 video lessons, and more are being added - clawhammer lessons from Bob Carlin are coming soon. In addition, a student can get personal banjo instruction by sending Tony Trischka a video via the site and receiving his response. The many features of the site are well worth checking out. A YouTube video taken at IBMA's World of Bluegrass 2009 includes a lot of good music: the 'blazing Czech player' mentioned is Martin Fridrich of COP (CZ). Thanks to Lilly Pavlak for forwarding news of the TTSB. The G2 Bluegrass Band (Sweden), #1 European Bluegrass Band 2007, are back from the 'two incredible weeks' of their third trip to the USA. The highlights included appearing on the Bluegrass Legends concert series in Chicago, on the WoodSongs Old-Time Radio Hour in Lexington, KY (the show can be seen here), and of course at IBMA's World of Bluegrass 2009 (see photo above). You can sign up here to receive G2's newsletters. 20 Nov. Cultureel Centrum Kerk 11, Zuiderdiep 505, Valthermond, Netherlands, 8.00 p.m.
21 Nov. Cafe Delfts Blauw, Kleine Berg 60, Eindhoven, Netherlands, 9.30 p.m.
22 Nov. Taverne De Waag, Damstraat, Haarlem, Netherlands, 5.00-7.00 p.m.
23 Nov. Musiekvenster, Radio Beverwijk, Netherlands, 8.00 p.m.
Phil Rosenthal and Naomi Sommers are preparing a tour of Britain and Ireland in September 2010, which is being booked by the Grapevine Music agency in the UK. Dave Bing will be our leader for each of the first two weeks, teaching fiddle and banjo along with his faithful assistant Kate Lissauer, OR, if enrollment is sufficient, he will be joined by his brother Tim Bing. Beverly Smith and Carl Jones will return for the October week. It would help greatly in the planning if people enroll early. Return participants in particular should let Kate know of their intentions as soon as possible. The residential weeks are held in a beautiful and remote part of mountainous southeastern Spain, near the village of El Fonte, Sorbas, an hour’s drive north of Almeria. The site is self-contained, all meals are provided and rooms are shared with one or two other people. Double rooms for couples are available. 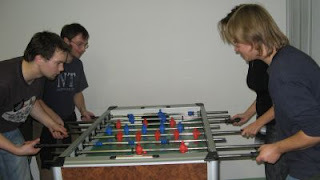 Non-playing spouses, friends and family members are welcome but they must charge the same fee to everyone. £475 per person, £240 per child 14 or under, and £375 for participants who are camping on site. There is plenty to do in the area and nearby, including sightseeing in the national park, visits to beaches, rock climbing, hill walking, and visits to Granada or other places of cultural interest. (Although they have found in the past that no one particularly wants to go anywhere else once they have arrived!) Room, full board, tuition and use of all facilities, including a 20-meter swimming pool, are included in the price. Participants must provide their own transportation, and Kate can help and advise with that, and can arrange transport from Almeria airport, which can normally be shared with other participants. A deposit of £100 will secure a place on the course. For more information, please e-mail Kate Lissauer. Thanks to Lilly Pavlak for the poster (left) announcing this year's Carter Stanley Memorial festival. It will be held on 5 December 2009 at the U Staryho Rebela ('Old Rebel Saloon') in Sloupnice, Czech Republic, instead of on 28 November, as was earlier announced in the European Bluegrass Blog post of 13 June, which gave the background and other details of the festival. Chairman Christopher Howard-Williams and his 200 volunteers... provided wonderful food, transport, and assistance of every kind and made the festival the most musician-friendly event we have ever had the privilege to attend. Read the band's full account on the Bluegrass Ireland Blog. After rave reviews for his performance at the Thomas Fraser Memorial Festival in Shetland (12-14 Nov.), Peter Rowan has begun a three-day tour in southern England before headlining the Vilnius Bluegrass Festival in Lithuania this coming weekend. Full details are on the European Bluegrass Blog for 15 Oct. Thanks to Al Evers of A-Train Entertainment, California, for the news that dates in Europe are being arranged for the Peter Rowan Bluegrass Band for August/September 2010. The band consists of four distinguished figures in bluegrass and acoustic music: Peter Rowan (guitar, vocals), Keith Little (banjo, vocals), Paul Knight (bass, vocals), and Jody Stecher (mandolin, vocals). Full details of the Peter Rowan Bluegrass Band and its members can be seen here. See also the entry on the European Booking Network page of the EBMA website. Promoters and event organisers who are interested in presenting this distinguished band should contact Al Evers by e-mail, post (A-Train Entertainment, 401 Grand Avenue, Ste. 300, Oakland, CA 94610, USA), phone (+1 510.893.4705), or fax (+1 510.893.4807). 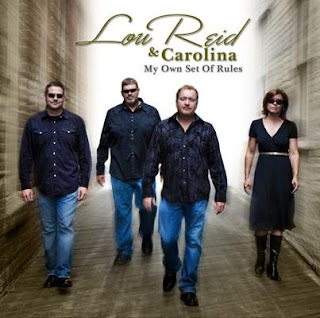 Lou Reid & Carolina (USA) have a new CD on Rural Rhythm, My own set of rules. This exciting band have expressed interest in coming to Europe. In 2007, when the IBMA enlisted members from outside the USA as MCs for World of Bluegrass's Fan Fest, Lou Reid & Carolina were introduced by Thierry Schoysman of Bluegrass in Belgium. The band's sound can be sampled through the many videos on their YouTube channel, where you can see and hear Lou Reid not only with Carolina but with the Seldom Scene, Longview, and guests such as Bobby Hicks. Other up-to-date news on the band is here and on their website. 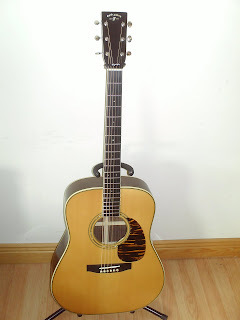 Ireland's leading bluegrass vocalist and instrumentalist, Clem O'Brien, is selling two Furch guitars: a D34 Vintage Bluegrass (left) and a D62 (right). Each comes with a professional case and an L.R. Baggs pickup and preamp. Full details are on the Bluegrass Ireland Blog. The suggested price for each guitar is €800. Contact Clem by e-mail.